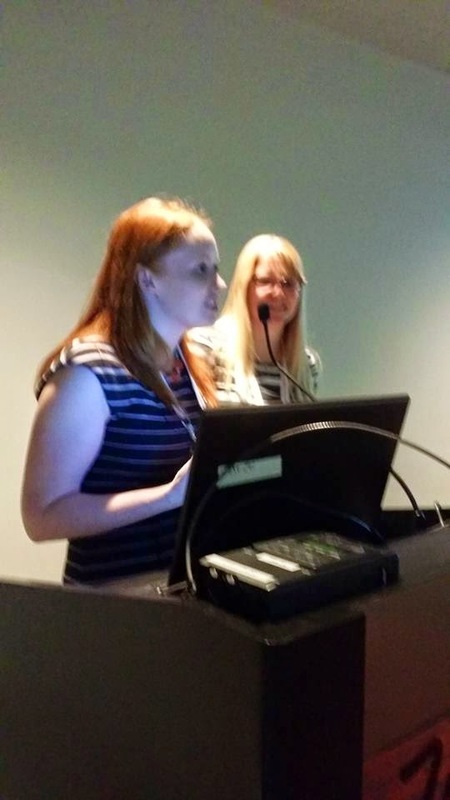 This year at ALA I was fortunate enough to be on the presenting side of things twice. Once for a Conversation Starter with the other Joint Chiefs of Storytime Underground (Amy’s write up is so good I’m just going to link to it and leave it at that). The other was an Ignite I co-presented with Brooke, who, I swear, is the best co-presenter EVER. No, really. Mostly, the pictures speak for themselves but also we quickly (because you only get 5 minutes-each slide advancing automatically every 15 seconds) talked about why it’s important to play (motor skills, thinking symbolically, language learning, and because it’s fun, dammit!) and that babies are NOT too young for super awesome play activities in the library. Here’s the only photo I know of that was taken. Thanks to JP for snapping it. He must have been too busy laughing (cuz, we’re hilarious, y’all) to get a non-blurry picture. Or, as Brooke said, it’s just our crazy energy! Brooke also wrote about our Ignite, as well as the the Storytime Underground Conversation Starter: Storytime: Not Just Reading Out Loud so go over there for even more details. She clearly has her life more together than I do. We’re both totally addicted to this kind of presentation so you can bet your bottoms we’ll be applying to do more in the future. Maybe on our collective obsession with snacks?